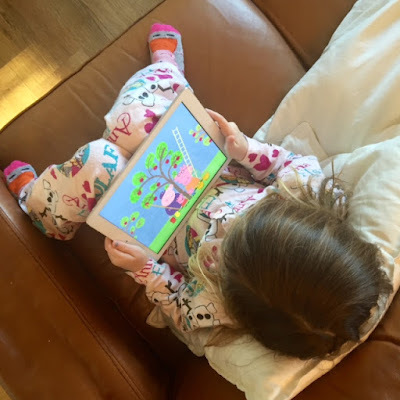 Peppa Pig Seasons App. Which we were kindly gifted a download code for so Ava could give it a whirl. This app definitely got the seal of approval. Especially since this miserable mama usually only allows Ava to download the free apps. The nice Peppa Pig people even sent her over her very own pink umbrella to boot which she has been parading proudly down the street at every available opportunity. She doesn't even need rain. My New Courgetti Trick. I love courgetti but the amount of water that comes off this vegetable when you cook it drives me crazy. So I've started putting my spiralised courgette in a colander, sprinkling liberally with salt and then leaving for half an hour before I cook it. The water drains out of the bottom and leaves me with a puddle free Puttanesca. Try it! Blowdries: Not mine (like I have time to go for a blowdry), but Ava's. Post bath hair drying has become one of my favourite times of day. Watching her through the mirror, perched on my knee as I dry her hair is the cutest thing. I adore watching her pretend to put on lipstick or tickle her face with my make-up brushes. She really is the girliest of little girls and that is fine by me. Farmers Market Purchases: Yesterdays included some beautiful blue duck eggs, a big chunk of local Crowdie cheese, a tub of creamy smoked trout pate and some organic smoked ham from a farm just outside Glasgow. A full fridge makes me happy. That and a full wine rack. Bargains. Speaking of my wine rack, I try and get a good peruse around my local Home Bargains whenever I get a chance. Having picked up some beautiful wine glasses recently for £3.99 (down from £34.99), I have discovered some amazing Merlot on their shelves for the bargain price of £4! Having paid a tenner for this particular bottle a few times in Waitrose, I am stocking up before they run out! Netflix. I seriously don't know how I survived so long without it. Having just re-watched all three series of Sherlock, I am excited to be powering through Breaking Bad so I can make a start on American Horror Story. You're starting to understand why it takes me 6 months to read a book aren't you? New Hair. Having recently had my locks lobbed off, I'm kind of missing the versatility of having longer hair. Yeah it dries quicker but I miss my messy buns. I'm never happy. This Wine Crate: Isn't it cool? After too'ing and fro'ing for ages over what to do with it, it now houses my entire CD collection and takes pride of place in the living room. Whatsapp for desktop. Seriously? Why did no one mention this? Not only do I organise most of my social life through Whatsapp but I also use it constantly for work meaning that by the end of the working day my battery has about 1% charge left on it. Someone recently introduced me to the desktop version and it has rocked my world. Birdseye Potato Waffles. I recently threw it out on Twitter that as a child I used to eat my potato waffles with butter and jam. Apparently this is unheard of and very weird. I decided to make this as a late night treat the other night (purely for nostalgia reasons) and can confirm it still tastes as good now as it did when I was 8.